In recent years, the number of pedestrian fatalities in the United States has grown at an alarming rate. From 2007 to 2016, the number of pedestrians killed by motor vehicles increased by 27 percent – marking a 25 year high. Whereas driver and passenger safety has continued to improve with the advent of new technologies, pedestrians remain susceptible to sustaining serious or fatal injuries. This is true whether they are walking within a crosswalk or outside of one; bringing up the important discussion of how pedestrian crossing safety can improve. While a large portion of fatalities occurred outside of pedestrian crossings, enough of them happened within crosswalks to warrant a discussion of who has the right of way. Although some states may vary, traffic control devices such as Pedestrian Crossing Signs are there to indicate when a motorist must stop or yield to a pedestrian. Unfortunately though, many communities in the United States still have uncontrolled crosswalks. In other words, they don’t have any clear indicators of who has the right of way. 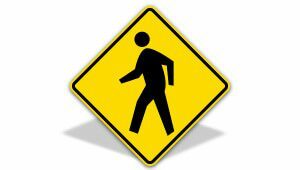 In instances where pedestrian crossing signs, countdown signals, or other traffic signs are not present at an intersection, most states only require motorists to yield for walkers. No matter if you are the pedestrian or the driver, it’s important to remember state laws regarding crosswalk and non-crosswalk use. If more people were informed, the number of injuries and deaths could be improved.